Transportation companies are expected to solve logistical challenges, improve service, optimize costs and increase efficiencies. More and more, they are turning to new IoT technologies to help them achieve this. 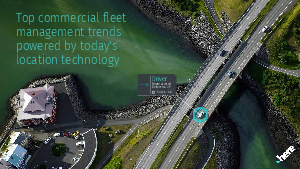 In this guide, we’ve identified the latest location, routing and other data-driven services, that are helping commercial fleet management and logistics organizations differentiate and lead the way in an increasingly complex market.